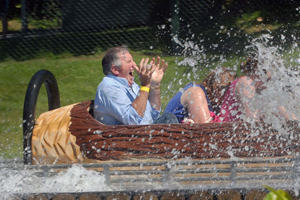 A Pirate Adventure Park favourite, the Pirates Plunge is a splash-tastic log flume water ride that guarantees to entertain. It has been heard that some children do it 25 times in one day! 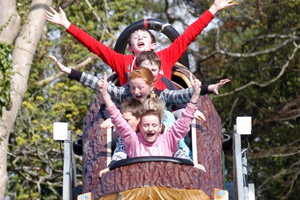 The only log flume of its kind in Ireland, the Pirates Plunge Log flume is an amusement ride that consists of a water flume and artificial hollow logs (or boats). Passengers sit in the logs which are propelled along the flume by the flow of water. The ride culminates with a rapid descent and splashdown into a body of water – a very exciting and entertaining way to get wet and cool off on a hot summer day. The Pirates Plunge is set amongst the trees at the Pirates Haven alongside the Pirate Queen Swinging Ship and Bouncy Castle. This ride is not suitable for persons with heart problems, back or neck injuries, those prone to motion sickness or expectant mothers. We’ll remind you at the ride but plan to remove hat or scarves etc. which may fly off when descending. It is your responsibility to take care of items which should not get wet i.e. camera mobile phones etc.